When we met these two for the first time, for 95% of the meeting, we just talked about life and a bit about how they met. Only til after the meeting when William got home, he noticed that we didn't even talk about the wedding and how we got so caught up in good ol' catch up. This was a sign on things to come. The wedding day in itself went off without a hitch, but it was the friendship formed with these two that made it that much more enjoyable to be a part of. 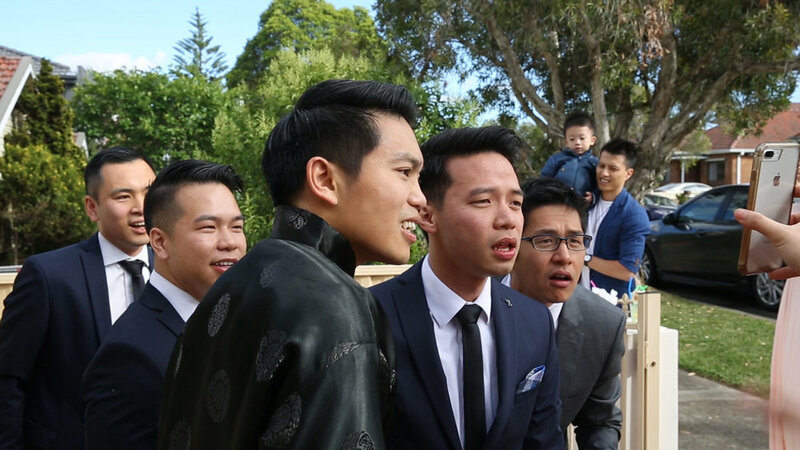 Chinese Door Games, Tea Ceremonies and an early start to the day is all part of a traditional Chinese wedding day. We began the day at their homes to get started with the preperations, then moved on to the infamous door games. This is where bridesmaids typically use this chance to get one over the groomsmen & groom himself while at the same time, collecting whatever money the guys decide to part ways with. Yoga Poses (those faces of the guys below is them trying to understand what a yoga pose is) and consuming vegemite & condensed milk from a tube were all part of what they had to do. Following on, the Tea Ceremonies were filled with traditions from both families. The Ceremony was located at the stunning Breakfast Point Chapel where a good friend of our Lillian Lyon, married these two and told stories of how they met and their love for food & running. William & Jenny, you guys are nothing short of amazing and fun. We had such a fun day filming your day and we wish you both nothing but happiness & love.